In our previous posts we have discussed synchronous motor working principle ,why synchronous motor is not self starting? 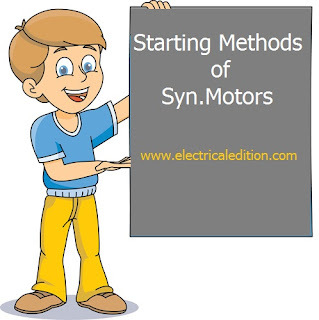 etc.The most important thing is why mostly we use synchronous motors over induction motors.Here we have the reasons..! Synchronous motor always runs at constant synchronous speed irrespective of the load and variable power factor operation. As seen earlier its power factor can be controlled by controlling its excitation. For over-excitation its power factor is leading in nature, which is very important from the power factor correction point of view. Not only for the above purposes we also use synchronous motors for power factor correction.You might have known about synchronous condenser[If not read here].Also used as phase advancers and phase modifiers for voltage regulation of the transmission lines. This is possible because the excitation of the synchronous motor can be adjusted as per the requirement. The disadvantages of synchronous motor are their higher cost, necessity of frequent maintenance and a need of d.c. excitation source, auxiliary device or additional winding provision to make it self starting. Overall their initial cost is very high. Harmonics: When the uniformly sinusoidally distributed air gap flux is cut by either the stationary or rotating armature sinusoidal emf is induced in the alternator. Hence the nature of the waveform of induced emf and current is sinusoidal. But when the alternator is loaded waveform will not continue to be sinusoidal or becomes non-sinusoidal. Such non-sinusoidal wave form is called complex wave form. By using Fourier series representation it is possible to represent complex non-sinusoidal waveform in terms of series of sinusoidal components called harmonics, whose frequencies are integral multiples of fundamental wave. The fundamental wave form is one which is having the frequency same as that of complex wave.The waveform, which is of the frequency twice that of the fundamental is called second harmonic. The one which is having the frequency three times that of the fundamental is called third harmonic and soon. These harmonic components can be represented as follows. 5th Harmonic e5 = Em5 Sin (5 t ± θ5) etc. In case of alternators as the field system and the stator coils are symmetrical the induced emf will also be symmetrical and hence the generated emf in an alternator will not contain any even harmonics. Slot Harmonics: As the armature or stator of an alternator is slotted, some harmonics are induced into the emf which is called slot harmonics. The presence of slot in the stator makes the air gap reluctance at the surface of the stator non uniform. Since in case of alternators the poles are moving or there is a relative motion between the stator and rotor, the slots and the teeth alternately occupy any point in the air gap. Due to this the reluctance or the air gap will be continuously varying. Due to this variation of reluctance ripples will be formed in the air gap between the rotor and stator slots and teeth. This ripple formed in the air gap will induce ripple emf called slot harmonics. 1. 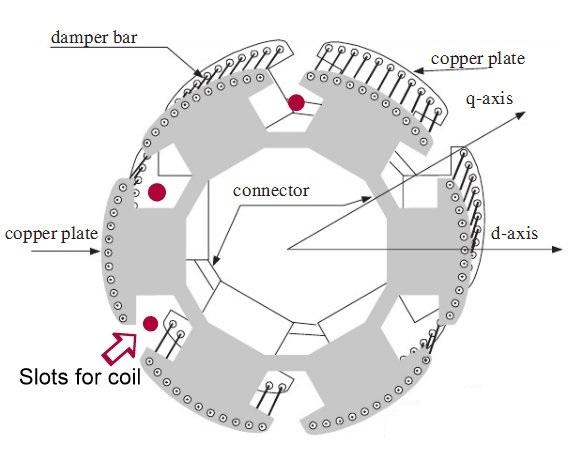 Distribution of stator winding. 5. Larger air gap length. The harmonics will affect both pitch factor and distribution factor and hence the induced emf. In a well designed alternator the air gap flux density distribution will be symmetrical and hence can be represented in Fourier series as follows. The pitch factor is given by Kp = cos /2, where is the chording angle. This is the detailed info about Harmonics In Synchronous Machines,Minimization Methods of Harmonics.Effect of Harmonics on induced emf. We have two major types of AC motors.They are synchronous and induction motor,synchronous motor runs at synchronous speed where induction motor runs at less than synchronous speed.In this article we are going to discuss on comparisons between synchronous and induction motor. 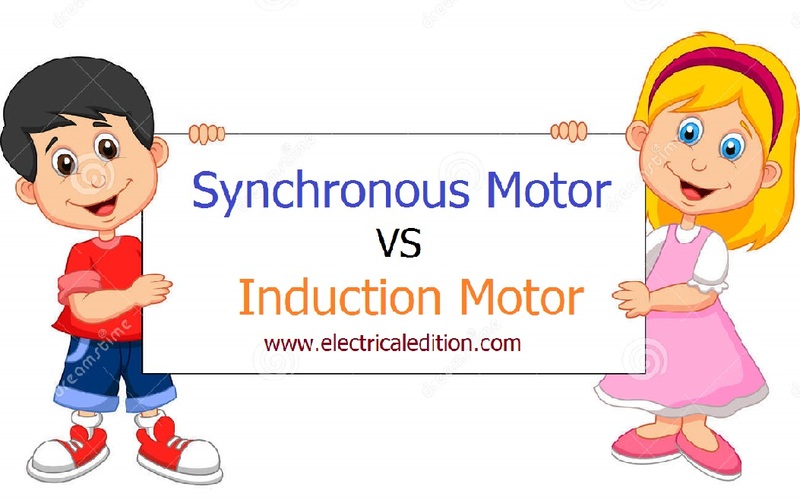 There are so many differences between synchronous motor and induction motor like excitation,speed control.etc.Most important points are listed below. Not self starting. (why read here) Self starting. so separate source is not necessary. Speed control is not possible. Speed control is possible though difficult. improvement. It can not be used as synchronous condenser. hunting results. Phenomenon of hunting is absent. A synchronous motor is a double-excited machine, its armature winding is energized from an a.c source and its field winding from d.c source.Synchronous motor operates at unity power factor when field current is enough to set up the air-gap flux, as demanded by constant applied voltage.This field current, which causes unity power factor operation of the synchronous motor, is called normal excitation or normal field current. If the the motor is under excited i.e, current is less than normal excitation,there will be some deficiency in flux to compensate that winding draws a magnetizing current from the a.c source and as a result of it, the motor operates at a lagging power factor.In other case, in over excited i.e, field current more than normal excitation machine operates at leading power factor.In the below figure you can observe leading and lagging variations. In synchronous motors performance characteristics obtained by v-curves and inverted v-curves. Synchronous machines have parabolic type characteristics.If excitation is varied from very low (under excitation) to very high (over excitation) value, then current Ia decreases, becomes minimum at unity p.f. and then again increases.But initial lagging current becomes unity and then becomes leading in nature.V-curves and inverted V-curves are used to analyze motor efficiency with no-load and with load. What are V and inverted V curves ? V-curve is a graph between Ia Vs If. Inverted V curve are drawn between cosΦ Vs If. In the above two cases If (field current) taken on x-axis.We can control the field excitation of synchronous motor by increasing/decreasing the field current. If graph of armature current drawn by the motor (Ia) against field current (If) is plotted, then its shape looks like alphabet V. If the power factor (cos Φ) is plotted against field current (If), then the shape of the graph looks like an inverted V.
Connect stator of motor to 3 phase supply as shown in the above figure through watt meters and ammeter. In this experiment two watt meter method is used to measure input power of motor.Ammeter reads the line current which is same as armature (stator) current. Voltmeter is reads line voltage. A rheostat in a potential divider arrangement is used in the field circuit to control the excitation.By changing its value note down the voltage,armature current,watt meter readings(W1&W2) in a table like below. Now IL = Ia, per phase value can be determined, from the stator winding connections. The graph can be plotted from this result table. This is the entire procedure can be repeated for various load conditions to obtain of V-curves and Inverted V-curves of any synchronous motor. 2. Using small d.c. motor. 3. As a slip ring induction motor. Pony motors are small motors mostly induction motors,which are used to run the rotor near to the synchronous speed. 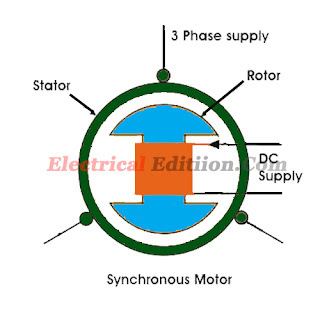 Once the rotor attains the synchronous speed, the d.c. excitation to the rotor is switched on.Pony motors are connected to the shaft of synchronous motor only up to it attains synchronous speed.Once the synchronism is established pony motor is decoupled. The motor then continues to rotate as synchronous motor. In the below figure we tried to show you pony motor connection to synchronous motor.This is not exact arrangement what we use in industries. 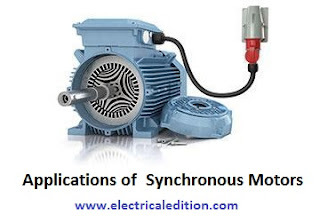 This is also similar to pony motor method with some advantages.Mostly this method employed for large synchronous motors.For synchronous motor a dc machine will be connected.This dc machine is used as a d.c. motor to rotate the synchronous motor at a synchronous speed.. Once motor starts running as a synchronous motor, the same d.c. machine acts as a d.c. generator to supply dc to the rotor of syn. motor.This have some advantages like low power usage and easy starting. 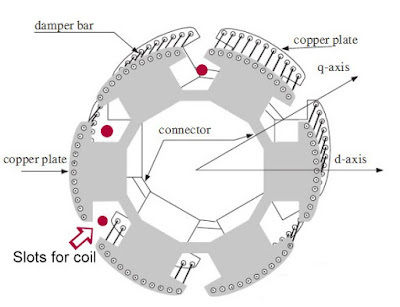 This is the most used method of starting synchronous motor.In addition to the normal field winding an additional winding consisting of copper bars placed in the slots in the pole faces.Ends of the copper bars are short circuited with the help of end rings.This winding is called damper winding.This damper winding acts as a squirrel cage rotor of an induction motor. 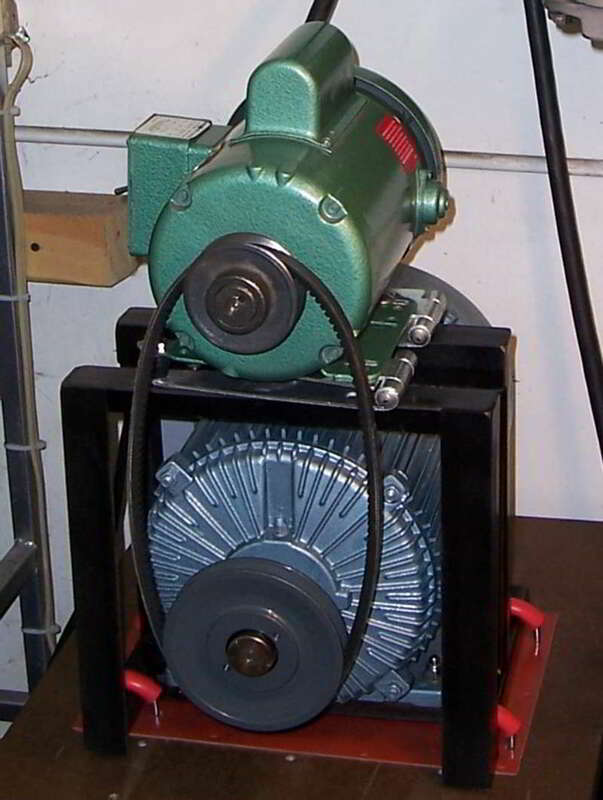 First synchronous motor runs as induction motor due to the damper winding at sub synchronous speed.Then d.c. supply is given to the field winding. At some instant motor gets pulled into synchronism and starts rotating at a synchronous speed.As rotor rotates at synchronous speed, the relative motion between damper winding and the rotating magnetic field is zero. Hence when motor is running as synchronous motor, there can not be any induced e.m.f. in the damper winding. So damper winding is active only at start, to run the motor as an induction motor at start. In this method an external rheostat then can be introduced in series with the rotor circuit. 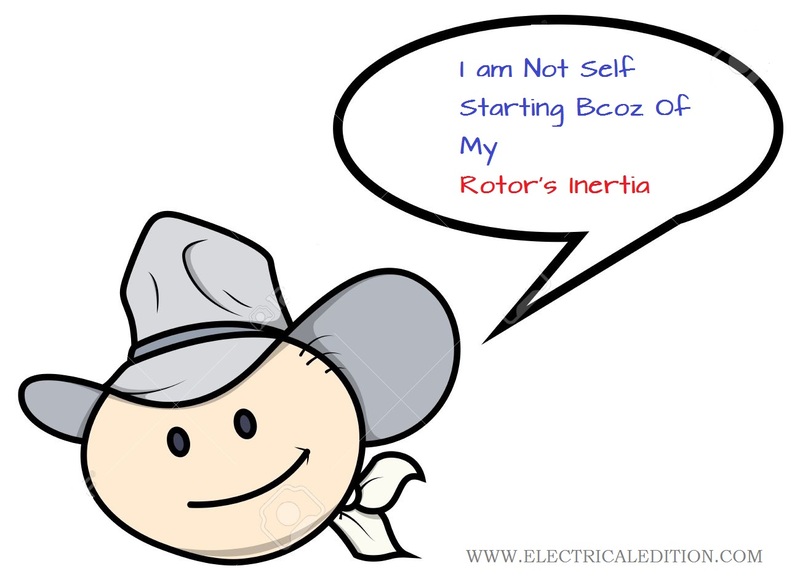 So when stator is excited, the motor starts as a slip ring induction motor and due to resistance added in the rotor provides high starting torque. The resistance is then gradually cut off, as motor gathers speed. When motor attains speed near synchronous. d.c. excitation is provided to the rotor, then motors gets pulled into synchronism ans starts rotating at synchronous speed. The damper winding is shorted by shorting the slip rings. The initial resistance added in the rotor not only provides high starting torque but also limits high inrush of starting current. Hence it acts as a motor resistance starter. Why Synchronous Motor Is Not Self Starting? Everyone is saying synchronous motors are not self starting but why here we going to discuss if you don't have time to read this whole article to know why synchronous motor is not self starting ANSWER IS INERTIA OF ROTOR.Let us have a detailed information on this topic. 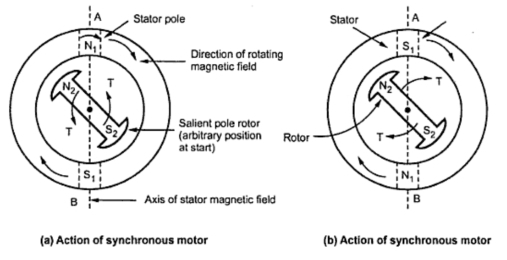 To get a clear idea about this question consider a rotating magnetic field as equivalent to physical rotation of two stator poles N1 and S1 as shown in the figure.Assume any instant like that two poles are in line with stator magnetic axis [A-B].At this instant, rotor poles are arbitrarily positioned as shown in the figure. 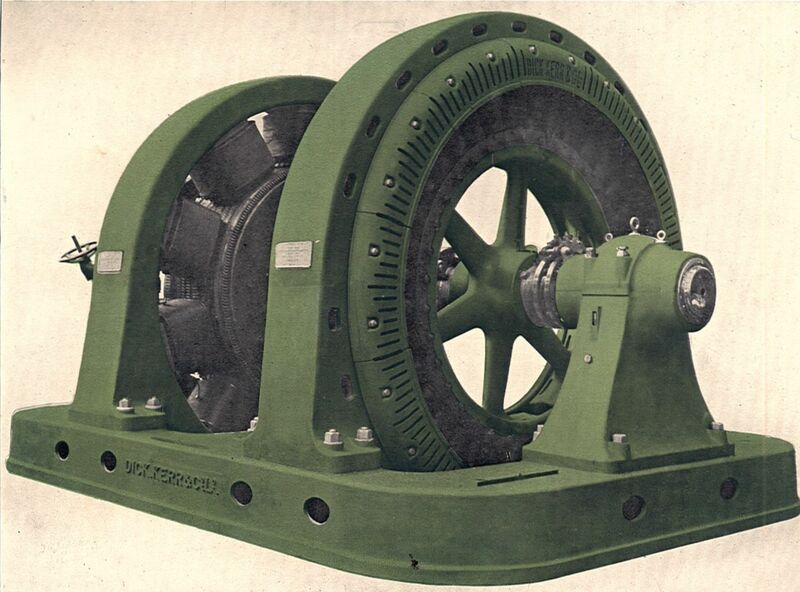 When DC supply is given to stationary rotor unlike poles will try to attract each other.Because of this action rotor will be subjected to an instantaneous torque in anticlockwise direction.As we connected power supply to stator,stator poles will rotate at speed of Ns r.p.m. Due to inertia of rotor it is unable to rotate in the direction of anticlockwise torque, to which is driving force or stator rotating field.Just in that instant the stator poles change their positions. Consider an instant half a period latter where stator poles are exactly reversed but due to inertia rotor is unable to rotate from its initial position.Shown in figure (b). At this instant, due to the unlike poles trying to attract each other, the rotor will be subjected to a torque in clockwise direction. This will tend to rotate rotor in the direction of rotating magnetic field.But before this happen, stator poles again change their position reversing the direction of the torque exerted on the rotor. Key Point : Hence the average torque on the rotor is zero.So synchronous motor will not start it self .